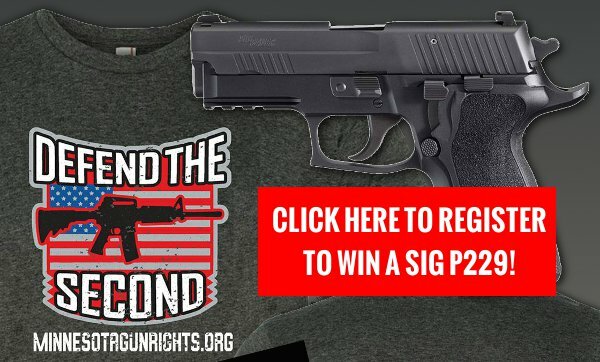 Win a SIG P229 from Minnesota Gun Rights! Media elites and lawless Deep State “investigators” are in a mad rush to topple this President. Their goal is to send the loud-and-clear message that politicians who aren’t Of the Swamp, For the Swamp and By the Swamp better NEVER even think of running for office again. They believe they have November 2018 in the bag after flooding our airwaves with a constant drumbeat of pure political poison since the day the 2016 election results poured in. All of this has gun-grabbers here in Minnesota licking their chops – convinced that changing political winds will deliver Minnesota’s Governorship and maybe even the Minnesota House. The Gun Control Lobby believes – that after the Parkland, Florida and Santa Fe, Texas murders and the media-drive mass anti-gun hysteria which ensued – Second Amendment supporters like you and me will just be too disillusioned to even bother showing up at the polls in November! As you’ll see, I’ve enclosed a special Second Amendment Turnout Pledge, letting me know you’re not going to just sit on your hands in November – and instead vote to hold gun-grabbing politicians accountable. Will you please click on this link or the image below and then sign and submit it to me at once? If you do, your name will be entered to win a special Sig Sauer P229 on September 11, 2018. This is the gun the Secret Service uses to protect President Trump from the hordes of violent anti-gun leftists – like the one who just recently attempted to shoot up the President’s Miami golf resort! And if you can possibly make a contribution of $35 or more, I’ll rush you a new Minnesota Gun Rights member T-shirt as well! As you may know, MGR has conducted special gun giveaways like this online from time to time and I’m doing so now because I need to get a gauge on Second Amendment supporters’ grassroots energy FAST. *** REPEALING “SHALL ISSUE,” to give local sheriffs the power to decide whether or not you’ll be permitted to carry a concealed weapon based on any criteria they choose. That could mean you’ll be denied based on your race, religion, political views – or because you didn’t write the Sheriff a fat campaign check! *** BANNING AR-15’S AND OTHER SO-CALLED “ASSAULT WEAPONS.” If the Gun Control Lobby gets their way, any firearm the gun-grabbers think looks “scary” – whether it’s a handgun, shotgun or rifle – will be banned. I hope you agree we cannot allow this madness to happen. Instead, we have to FIGHT BACK now – before it’s too late. >>> Second, please agree to your most generous contribution. If you can give $35 or more, I’ll rush you a special MGR Member T-shirt. But my hope is that you’ll agree to $100 or $50. Or, if that’s too much, please just give whatever you can afford. Your generosity will be a big help to our election year plans, which are already being put into action! Site, you’re a critical part of Minnesota Gun Rights’ winning team. But there’s more at stake for Minnesota this year than ever before. So please sign and submit your petition and agree to a generous contribution of $75, $50 or whatever you can afford today! P.S. Will you please sign and submit the enclosed Second Amendment Turnout Pledge? If you do, your name will be entered to win a special Sig Sauer P229 on September 11, – the gun the Secret Service uses to protect President Trump from the hordes of violent anti-gun leftists – like the one who just tried to shoot up the President’s Miami golf resort! If you can possibly make a contribution of $35 or more, I’ll rush you a new Minnesota Gun Rights member T-shirt! Heading Out to Hurricane Florence – Please Help!